One of the most unusual destinations in America is the majestic Joshua Tree National Park. 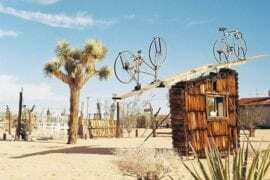 While it’s nearly impossible to find a traditional hotel in Joshua Tree, there are many fantastic and unique vacation rentals to choose from. 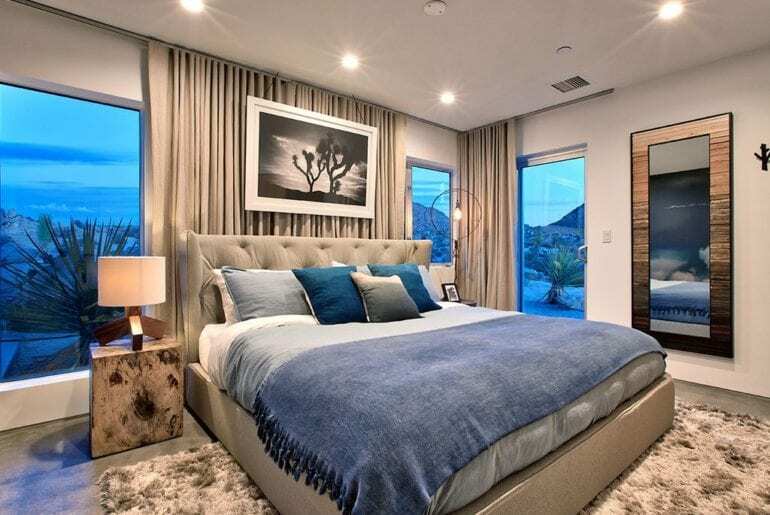 If you’re looking for a truly memorable and luxe getaway, look no further than our list of the best Joshua Tree VRBO rentals below. 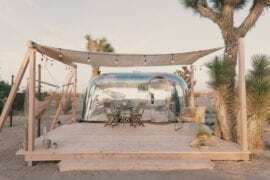 Wellness seekers and nature lovers adore dreamy Joshua Tree, for good reason. This sunny, stunning SoCal destination is perfect for travelers looking to get off the grid. Connect with Mother Earth on a deeper level with sunrise yoga overlooking the desert sprawl or dust off the cobwebs with an invigorating hike through the National Park. Haven’t you heard, wellbeing is the new definition of luxury! 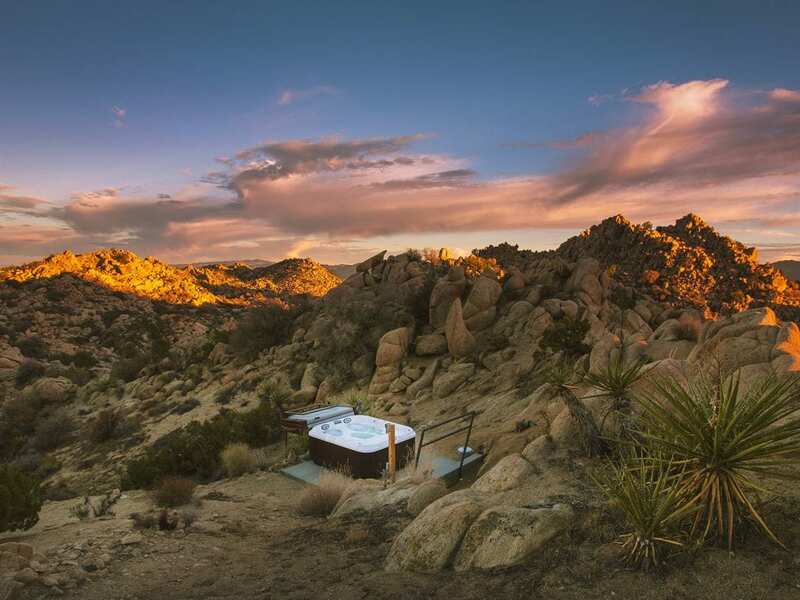 You certainly don’t need a butler or a 5-star label to embrace the luxe life in Joshua Tree. For a truly exceptional getaway, you know you can trust the expert curators at The Local Vibe to find the cream of the crop. 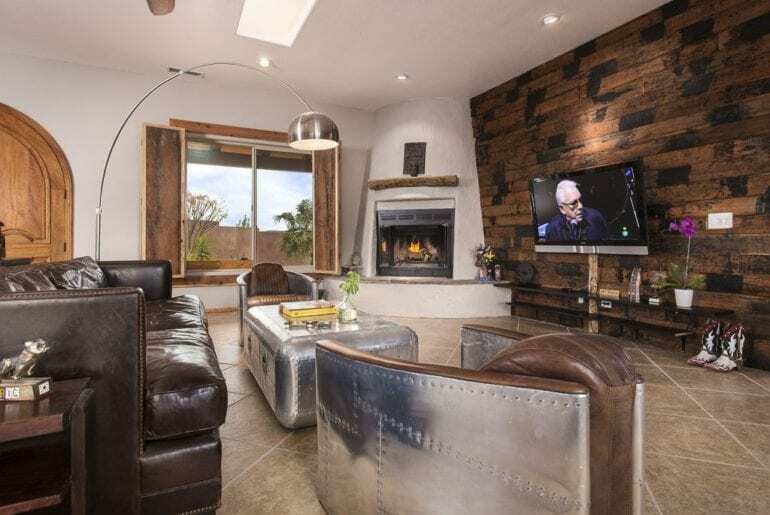 The 8 luxury Joshua Tree VRBO properties below boast a wide range of unique architecture, stunning boho design, and natural flow to their outdoor spaces. 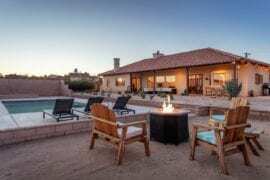 This unique, Spanish Pueblo-style desert retreat is the perfect Joshua Tree VRBO for creatives. Whether you’re writing a novel, working on an artistic masterpiece, or simply seeking solitude in the high desert, this is a space that’s sure to inspire. Warm and rustic-feeling, the large floor plan includes five bedrooms and three bathrooms, with room to comfortably accommodate up to 12 guests. The heart of this home is its large, welcoming living space with a wood-burning fireplace. Your own designated office awaits, complete with workspace, drawing table, and inspiring views of the sprawling desert. Outside is a beautiful saltwater swimming pool, spa, and sun loungers. The wooden deck is well-suited for quiet meditation or a morning yoga session, while an additional rooftop deck is the perfect spot for stargazing in the evening. 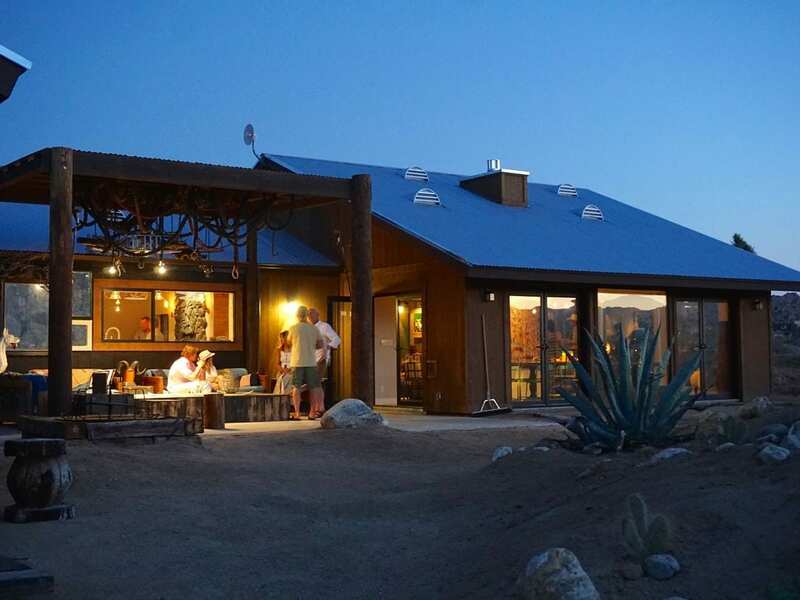 Your very own adobe desert retreat can be booked for an average $900 a night. 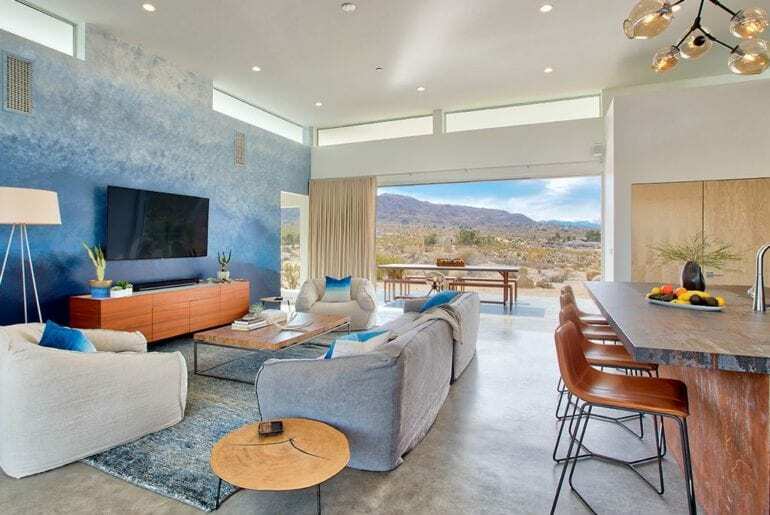 Beautifully intertwined with its rugged, natural surroundings, this contemporary luxury home in Joshua Tree is ideal for a SoCal family getaway. 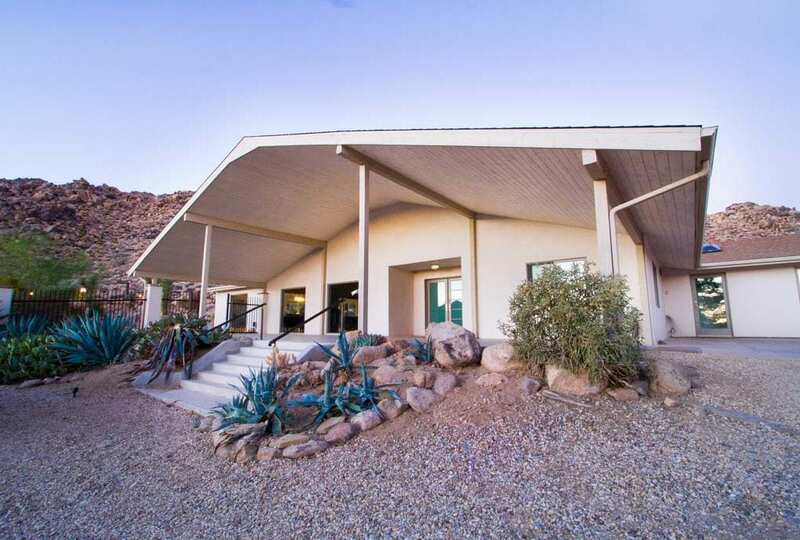 With four bedrooms and three full bathrooms, this Joshua Tree VRBO sleeps up to nine guests easily. The huge, open-concept living space is perfect for hanging out together, enjoying a friendly game of charades or a casual movie night. You’re never more than a short drive into town, but you may find that preparing meals in this home’s sleek, high-end kitchen is an absolute delight! Eat together in the large, dining room to enjoy one another’s company and conversation without any distractions. For even more entertaining and family fun, the outdoor space is ready and waiting with a large wet bar, BBQ grill, and resort-style swimming pool with jacuzzi tub. 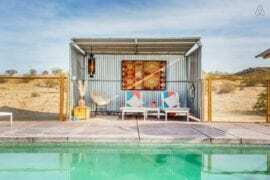 Your next Joshua Tree vacation home is available for $750 a night, on average. Set on five private acres of stunning desert landscape, this architectural villa with pool in Joshua Tree is a perfect fusion of Wabi Sabi and modern design. 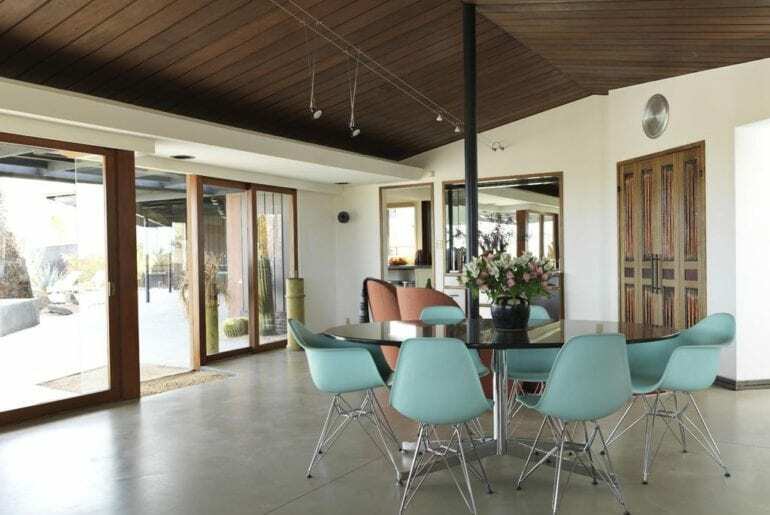 Poured concrete floors are cool to the touch throughout while soaring ceilings and large windows create an airy feel, flooding the space with natural light. At the home’s core is its open-concept floor plan, where a designer-grade gourmet kitchen flows seamlessly into the lounge area and outdoors to a covered deck with dining space. Available to book for $850 a night on average, this glamorous villa can accommodate 6 guests comfortably, making it perfect for an intimate getaway with friends. There are three individually-designed bedrooms and 2 full bathrooms, plus an expansive outdoor entertaining area. The 1800 sq. ft. deck flows between lush garden landscaping toward a heated swimming pool with hot tub. There’s even an oversized fire pit, ready for your group to roast a few marshmallows and enjoy the starlit desert night sky. 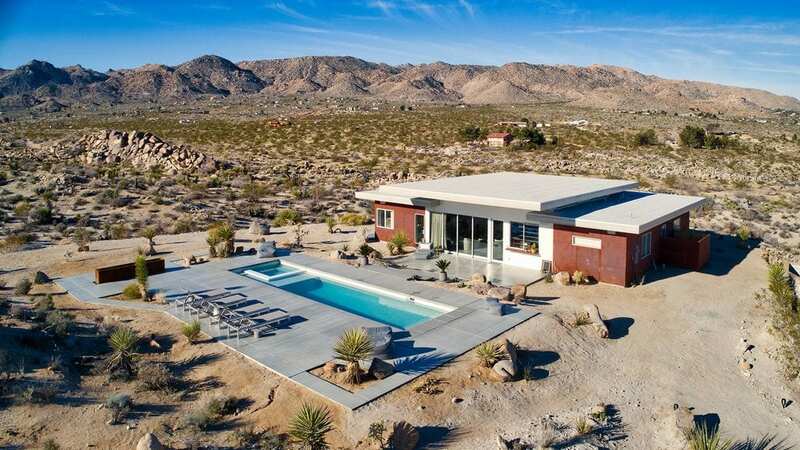 This one might just be the most unique Joshua Tree VRBO rentals around. Colorful tiles and textiles collected over decades from around the world create a fun, eclectic vibe in this large adobe villa with swimming pool. 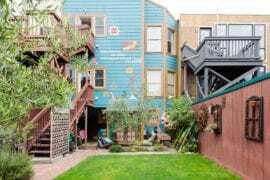 This one is particularly fun for families with kids as there are numerous nooks and crannies to explore. 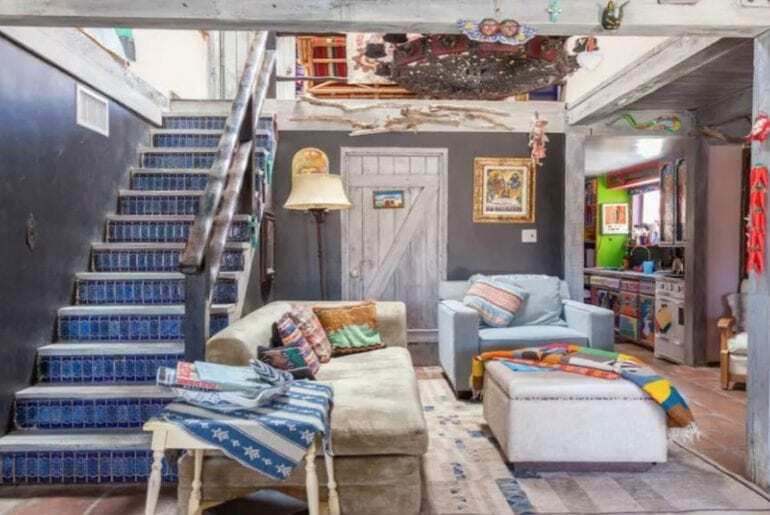 We especially love the cave-like loft bedroom with its spiral staircase leading down to a private den. There are five bedrooms in total (some with multiple beds), plus 2.5 bathrooms, plenty of space for up to 14 guests. The large outdoor swimming pool has a desert oasis vibe, with multiple sun loungers and shaded spaces to entertain. Available from $795 a night, this colorful home is set on 15 sprawling acres for absolute privacy and seclusion. Joshua Tree National Park is about a 20-minute drive away, but you’ll find plenty to explore on your own property from private hiking trails to hidden creeks and waterfalls. If you’re looking for a truly exceptional, intimate desert retreat, you’ll fall hard for this Joshua Tree VRBO. 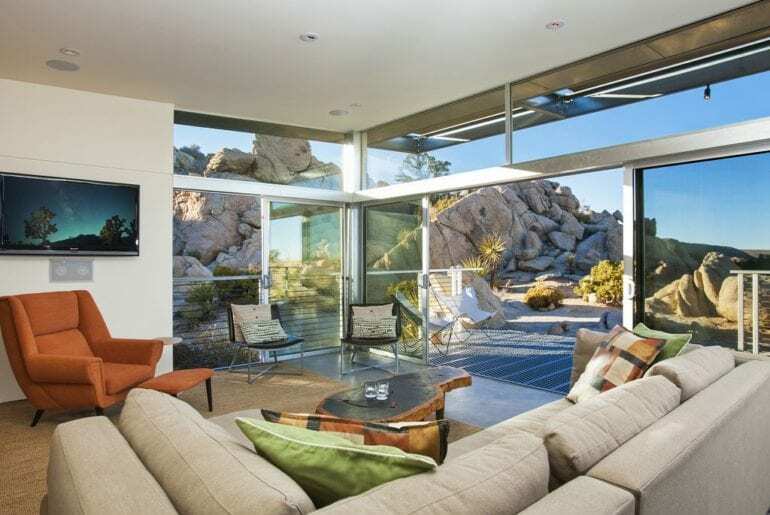 Featured in Dwell magazine, this modern designer home with pool and hot tub is a luxurious Mojave Desert escape. 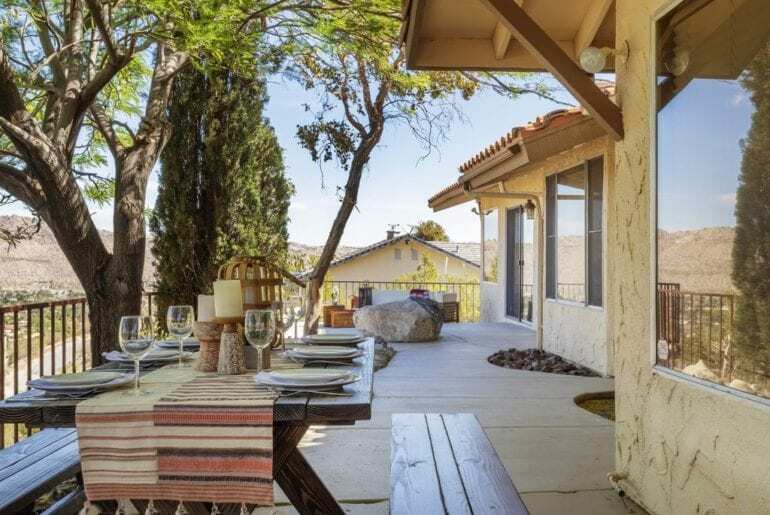 Although the home is located close to the town of Yucca Valley, you’ll still feel secluded amongst the weathered boulders and desert plains. 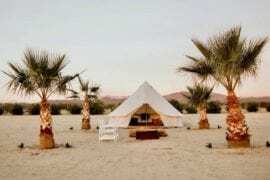 Available for $999 a night on average, this unique Joshua Tree rental sleeps up to four guests for a private, intimate-feeling getaway. With two bedrooms and one bathroom, this property is best suited for friends or couples. 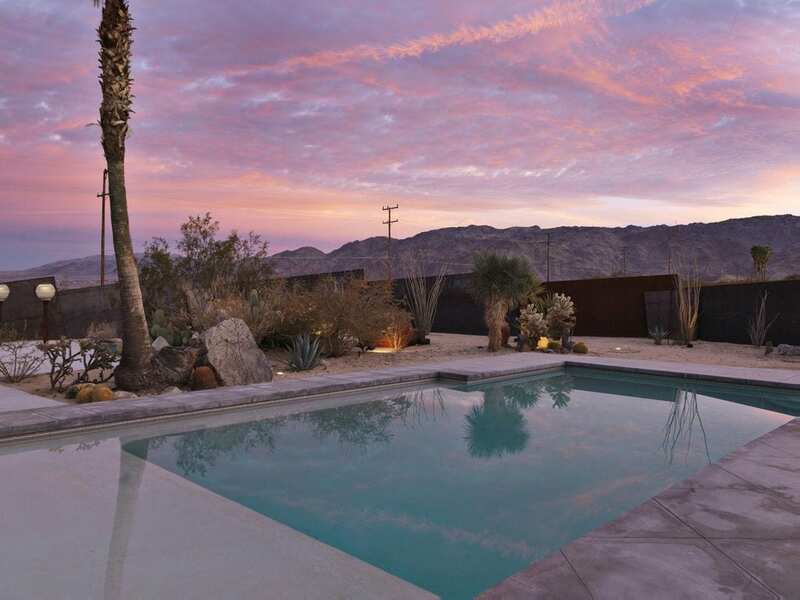 An extremely romantic Joshua Tree VRBO, this dramatic desert setting simply can’t be beaten. Inside the main homestead is a bright, open-concept floor plan with a full kitchen, dining area, and a comfortable lounge. There’s an effortless flow from the indoors out, with multiple spaces created for relaxing in nature. 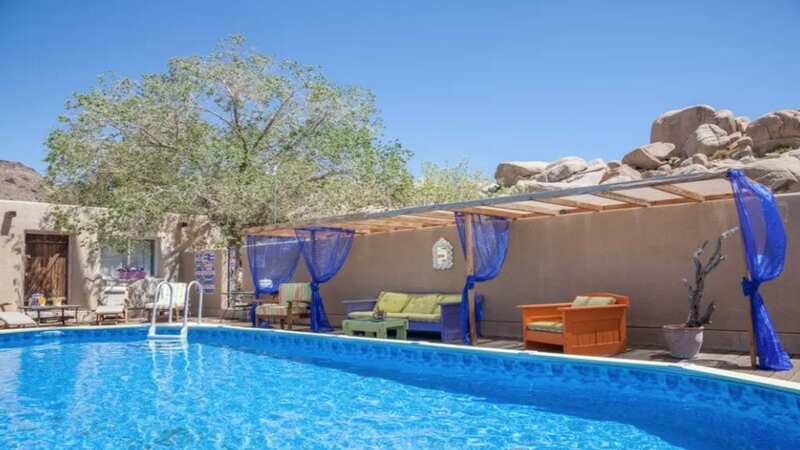 Practice your asanas on the outdoor deck, take a refreshing dip in the cowboy-style pool, or venture over to the private hot tub deck to soak in utter seclusion amongst the dramatic desert boulders. 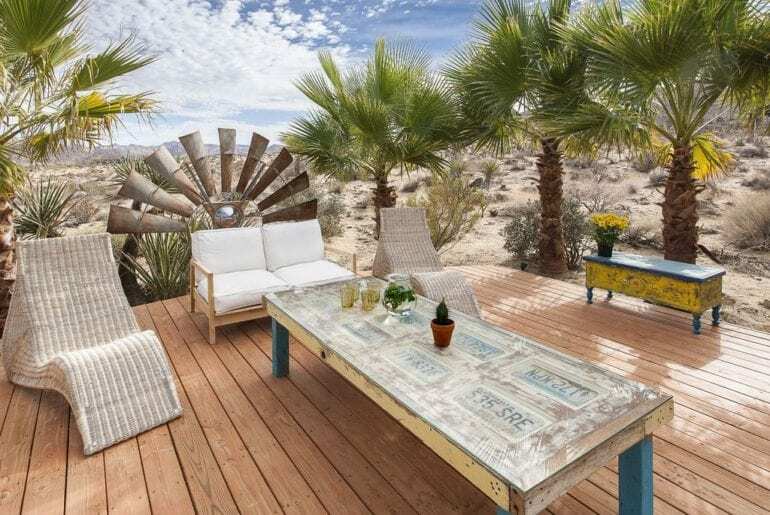 Once owned by famed California TV personality Huell Howser, this beautiful, 12-acre Bohemian ranch is one of the chicest Joshua Tree VRBO rentals we found. 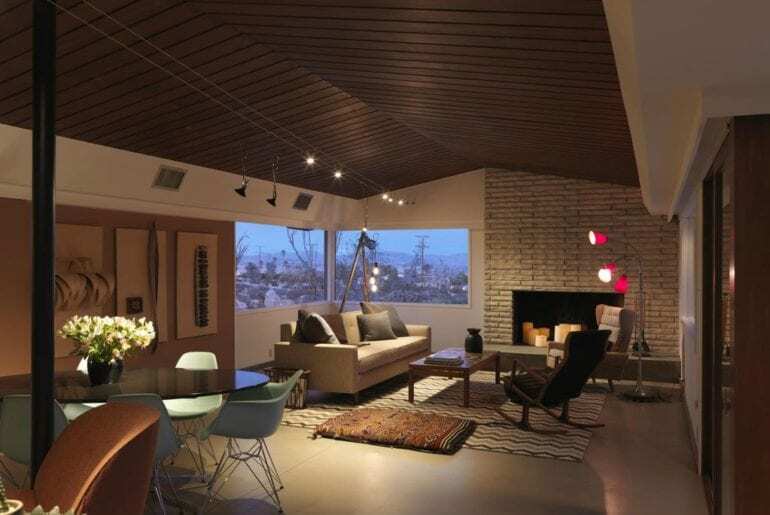 Filled with designer mid-century furniture and lush Boho textiles, the space is at once both glamorous and inviting. With three bedrooms and two bathrooms, the home can accommodate up to 12 guests. The ample indoor/outdoor space and smart layout mean the property is also well-suited for retreats, small weddings, and intimate events in the magical Mojave Desert. Available for around $660 a night, on average, this Bohemian ranch getaway boasts a gourmet kitchen, light-filled living room, separate dining area, and an additional sunroom lounge space. Outside, there are numerous ways to stay entertained and enjoy the stunning natural surroundings. Get cozy beside the built-in fire pit, swim a few laps in the large pool, or simply soak your cares away in your own private hot tub. 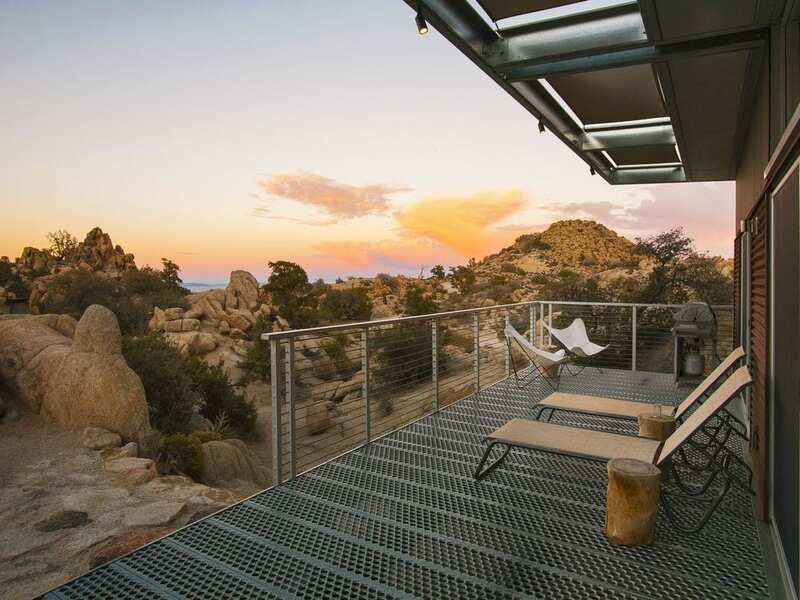 This is truly an exceptional place for a memorable Joshua Tree getaway. 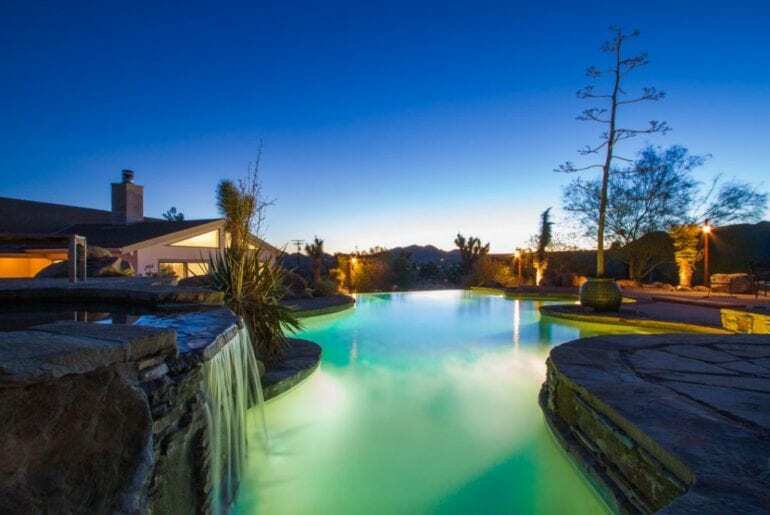 Overlooking Joshua Tree National Park and Yucca Valley is this ultra-private, luxury Joshua Tree VRBO with pool. 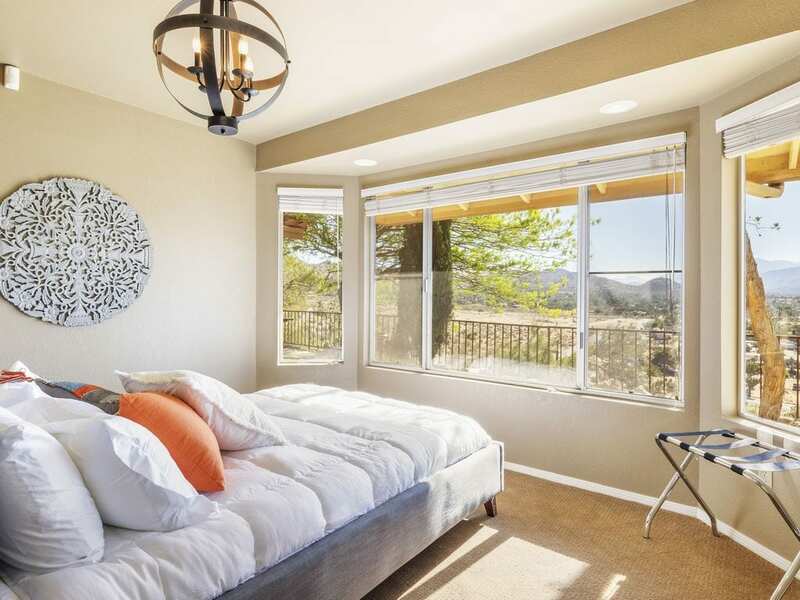 This spectacular property is perched on a hilltop, enjoying breathtaking views from all sides of the National Park, boulders, and mountain ranges. The amenities and fixtures are absolutely top-notch! 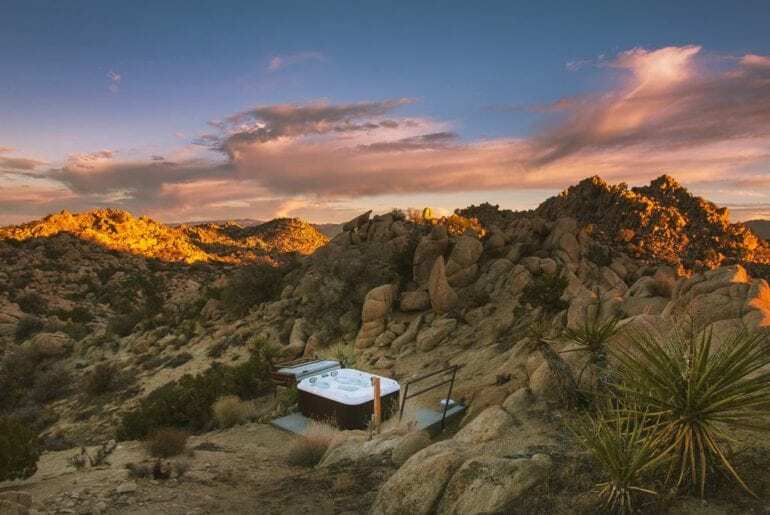 What other Joshua Tree vacation rental can boast its own private infinity pool and jacuzzi with views? That feature alone surely makes the $1,049 average nightly rate worth every penny. The house itself is perfect for groups of up to 12, with five bedrooms and three bathrooms. 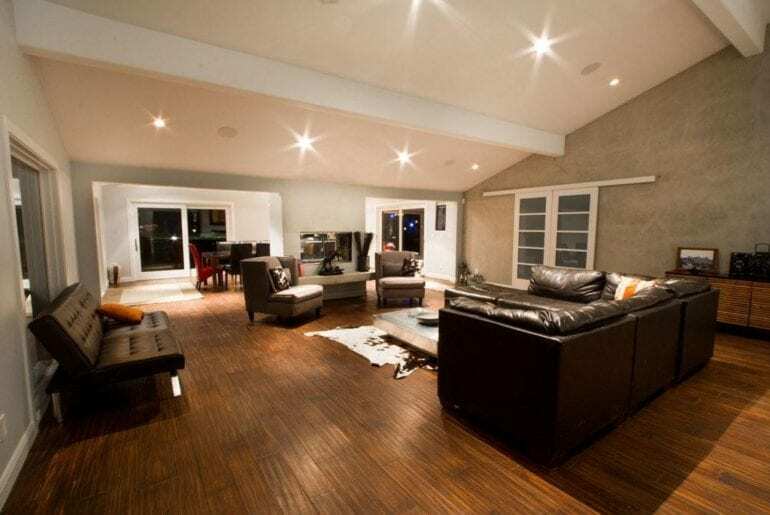 Enjoy a comfortable family room with yoga setup as well as a large, open-concept living space with modern kitchen. There is ample space to entertain outside, too, with an outdoor dining table, BBQ grill and lounge area. The property enjoys sweeping views from all angles, including particularly beautiful sunsets to the west. 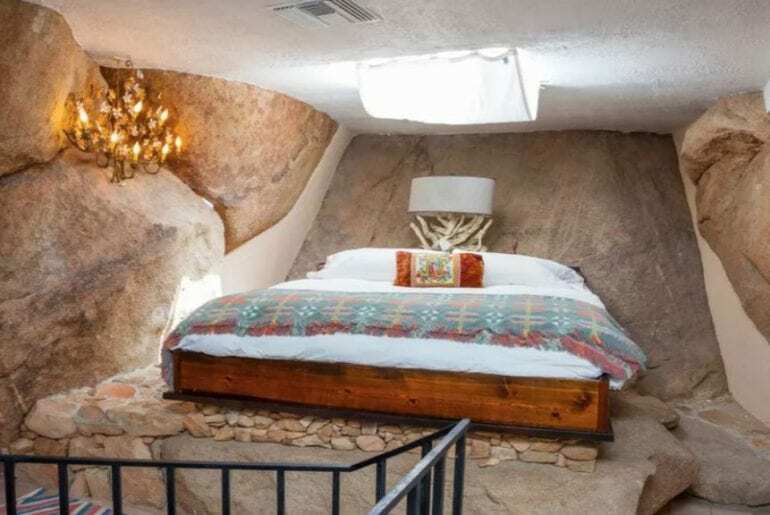 OK, we admit it: this has to be the coolest and more unique Joshua Tree VRBO rental ever! 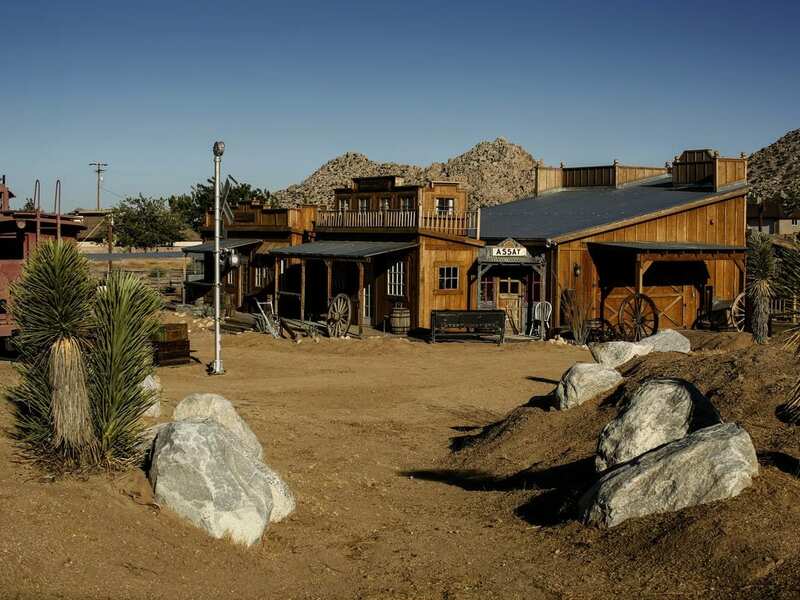 Round up your friends and family for a wild, memorable experience when you stay in an entire small pioneer town in the desert. Founded by Roy Rogers and the Sons of the Pioneers, you can book this entire small town “movie set” for an average nightly rate of just $989 a night. 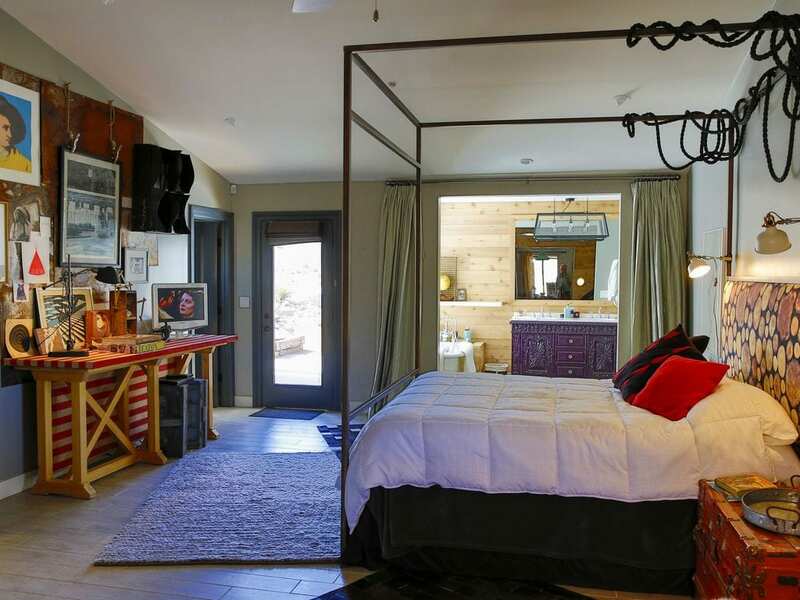 This incredible property can accommodate up to 10 guests between the main house, two private ensuite casitas, and an original train caboose renovated into a studio bedroom with ensuite. There’s also a teepee, small church, and saloon to explore on the property, adding to its old school, small-town appeal. While you’ll feel like you’ve been transported back in time to a true pioneer town, you can easily walk just ten minutes and reach popular local spots like Pappy & Harriet’s honky-tonk restaurant. There are private hiking trails on the property, but Joshua Tree National Park is also just a short drive away.